Sometimes events during the pregnancy can impact the mother and baby, such as accidents, illnesses, surgery, or even just a growing baby getting itself in an awkward position or an uncomfortable position for the mother. Osteopathy can ease the stress of these events. The process of birth can be overwhelming for mother and baby and I recommend that both come for treatment as soon as the mother feels able to after the birth. In a newborn baby, the bones of the skull are soft, and are made up of cartilage and membrane. This is to allow the skull bones to overlap and mold during birth. This picture shows the sutures of the skull, which are the joins between the different bones which make up the skull. During a normal birth the skull undergoes some compression. 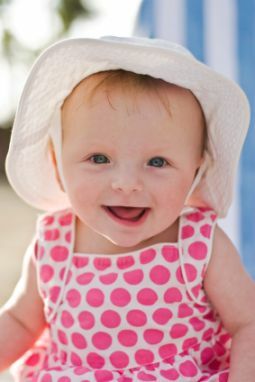 A baby who is not in pain will be a happier baby. Of course Osteopathy cannot change the diagnosis of children born with a congenital condition, but it can alleviate some of the physical problems associated with that condition. For example, babies and children with Down's syndrome often have problems breathing because of narrowed sinuses. For best results, treatment should begin before the age of 3 years as after this the bones start to harden and the stresses and asymmetries caused by birth cannot always be completely eliminated. Profound changes take place in a child's body as they grow. Changes occur physically, mentally and emotionally especially from the ages of 10 to 16 years as children make the transition to adulthood. It is never too early and hardly ever too late for a child to try Cranial Osteopathy. I recommend 4 to 6 treatments to address the main presenting problem, and then regular monthly check ups for babies, and every 3 months for children to help with teething and growth and to resolve the effects of any falls, injuries and illnesses which are an inevitable part of childhood. Cranial treatment can bring a feeling of deep relaxation and babies will often fall asleep during treatment. Cranial Osteopathy is so gentle that it is safe and suitable for people of all ages, especially newborn babies and children, and also the elderly or people with fragile or acutely painful conditions. Why haven't I heard of Cranial Osteopathy before? Cranial Osteopathy is better known in the USA where the treatment technique originated. It is becoming much better known now and more widely available in the UK as more osteopaths are willing to study and use it, and more patients ask for it.